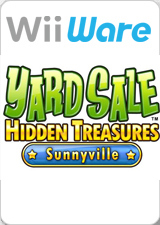 Yard Sale Hidden Treasures: Sunnyville: Welcome to the town of Sunnyville! Search local yard sales on your mission to find hidden treasures and objects. Use your fantastic finds to decorate your dream home in a competition to win the illustrious “Superstar Homes Magazine Contest!” Beat the clock or play at your own pace, searching for hundreds of items hidden in fun locales. Enjoy nonstop challenges in this expansive seek-and-find game! The graph below charts the compatibility with Yard Sale Hidden Treasures: Sunnyville since Dolphin's 2.0 release, listing revisions only where a compatibility change occurred. This page was last edited on 18 February 2018, at 13:10.